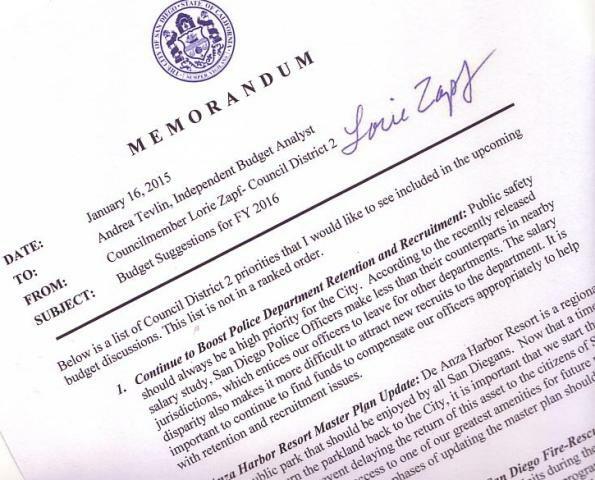 A City of San Diego memo from the office of Councilwoman Lorie Zapf that the OB Rag has obtained shows that the expansion of the Ocean Beach Library is one of Zapf’s top 7 budget concerns. The memo then goes on to list 7 priorities, with number 7 being “Ocean Beach Library Expansion”. The other six funding priorities include Police officer retention, De Anza Cove Plan update, street repairs, and the Ocean Beach Lifeguard Station. This is unequivocal language. And we applaud Zapf for making the expansion one of her top priorities. The memo purports to have Zapf’s signature at the top next to her name. A call into her office has not been returned by the time this post was published and the OB Rag was told that the memo is genuine. Zapf had been given a tour of the OB branch last Fall by members of the Friends of the Ocean Beach Library. The Friends are engaged in a campaign to have the OB branch expanded and have a petition being circulated. Continue to Boost Police Department Retention and Recruitment. Zapf will be in Ocean Beach this week at the January 28th OB Town Council meeting. That signature isn’t Lorie Zapf’s. If you go to this link, you can see here signature on her Form 700 Disclosure statement. Or, maybe that signature isn’t hers? Okay, but we have heard from her office and the memo is genuine. I wasn’t questioning the authenticity of the memo. But, I am wondering who put the list together. I tried googling Zapf’s name plus the OB Library and could not find that she had said anything about it in the past. If a person wanted to be on OB’s good side, the library issue would be perfect. There have certainly been politicians who have seen an opportunity for good press by being in favor of something they know will not happen, kind of like Congress voting to repeal the Affordable Healthcare Act over and over. I’m not trying to rain on anyone’s parade, I’m just an old skeptic. Let’s see. Language is more specific about the library (which I do support) but not about the lifeguard station, which is woefully in need of a major upgrade. Books or saving people’s lives. Have I simplified this too much? Thoughts?? This is excellent news. 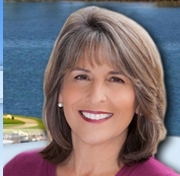 We need Lorie Zapf going to bat to get the library built asap. This project has sat around and been shoved to the side way too often. Thank you, Lorie! Same for the lifeguard station, Dita. They have been hearing for years it was going to be replaced. I heard there was even money set aside a long time ago. What politician played with that dough and where did it go? Again, books and education are wonderful. but what about all the lives that are saved from our lifeguards and not having the right equipment and facilities to keep that going? OB should inherit the north PB lifeguard station project proposed for Law St., which is up to $7 million last time I looked, that we DON’T want here on the disappearing beaches in North Pacific Beach, as we have another brand new lifeguard tower/garage at Grand Ave., a couple of blocks away…(another case of the people’s beaches being absorbed by construction like at Belmont Park) and OB does want a new one as their lifeguard unit is vintage. As for libraries, my compliments to recent policies that have given the Pacific Beach library many more open hours and programs, and it is a wonderful community resource, for all, thank you, and keep up the good work for libraries ! Any guesses on cost to renovate the new library? My guess is the estimate will be $30 million and actual would be $40 million. If the library goes full green the cost would be $50 million, which would save hundreds of dollars in utility costs per year. How did you arrive at these figures and what is the cost per square foot? The Ocean Beach Friends of the Library are happy to work with Council Member Lorie Zapf to make the expanded OB Library a tangible reality in the foreseeable future.